Unfortunately, there's no 5 Minute Madness this week, but what better way to ring in the last month of the year with a holiday gift guide post. So, when I'm stumped during this busy holiday season (especially) when it comes to gift giving I always love checking out gift guides for ideas. I hope that I can ignite some ideas for you, when you get stumped this busy holiday season. I had heard about this release since the middle of the year and let me let you, I was sooo ready for it and sooo excited too! If you know a big beauty junkie and are looking for a really luxury product head straight for the Hourglass Ambient Lighting Edit Palette Vol. 3. It's got a great variety of shades with a huge mirror making it great for travel. It includes x2 face powder, x2 blushes, 1 highlighter and 1 bronzer. (Though I do wish the bronzer was a bit darker, as it may be too dark for darker skin and I am a tad tan but the dark blush shade has quickly become one of my fave blushes). It's also a great way to try out the brand if you know someone who is keen to give Hourglass go. Plus who can't resist the gorgeous rose gold packaging! Now on the other side of the spectrum is the cutest packaging that you can get on a budget. Folklore lip balms comes in a variety of different scents with a variety of cute designs. I've purchased the forest blueberry and wild strawberry from Monster Threads but they also come with accompanying hand creams and body butters with the same cute design. They all have different animals with little personal descriptions so this is a great idea to personalise for who whoever you decide to give these to. (Plus, you can never have enough lip balms!) They also smell divine. To me, they smell like hubba bubba bubblegum. When it comes to bath products Oh Deer Sugar are one of my fave handcrafted, vegan and cruelty free bath products. I've bought a couple products before and I'm a huge fan of their bath products (Plus they're homegrown Aussie's too!) Their waffles bars are their go to's when it comes to baths so be prepared to watch and array of colours as they fizz. Especially if you want to surprise yourself or the one your gifting to, then get your hands on the Mystery Waffle Bar* (shhhh - be quick they are limited stock). Their waffles bar are different than anything that I've every tried. They slowly leave your bath foamy and it is very calming to watch the combination of all the vibrant colour slowly fizz together. There is also something about Oh Deer Sugar that dry and sensitive skin people (like me) absolutely love. As I find their bath products leave the water so silky and soft and is really moisturising for my skin. I also think it's really exciting when a company decides to create limited edition Christmas products and Oh Deer Sugar do not disappoint. From Christmas macaron snowflakes and candy cane bubblebars to even grinch and santa waffle bombs. There's a whole selection to choose from for any bath aficionado. As a girl with dry skin all year round, summer is no exception. 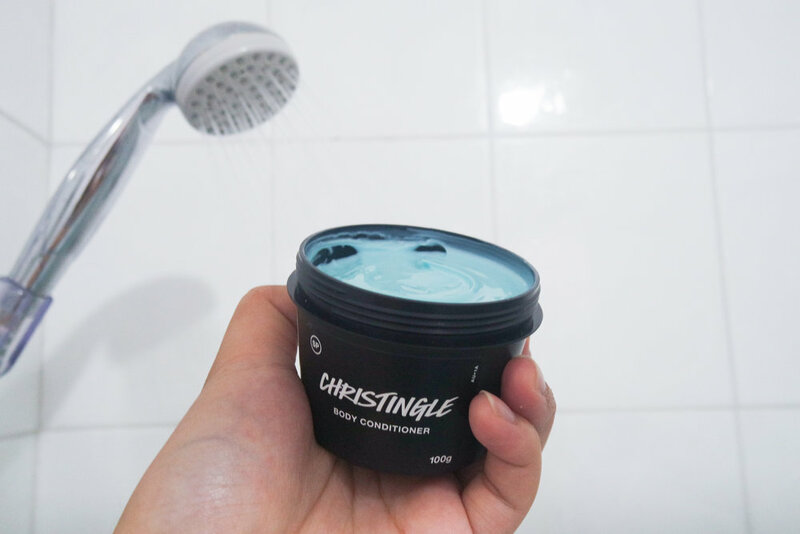 So when the holidays roll around LUSH Christingle Body Conditioner (aka. in-shower body lotion) has became a holy grail for me to purchase year in and out since it's release. So if you know someone who has the same issue. This body conditioner is a sure way to please your fellow dry skinned friend. Plus the pepperminty menthol tingle also helps keep your body cooler especially during these scorching Aussie summer days. Now, if you know someone who is a fan of chai lattes, (and let's face it, who isn't) once Christmas rolls almost anything gingerbread scented will be able to match! So Oh Deer Sugar's Gingerbread Body Scrub* has hit the ball park this year with that scent. It's also not just a plain sugar scrub like most of their usual scrubs or any scrub you are probably used to. As this has quite a granule mousse like texture so it is more moisturising. It also comes in quite a large tub so your giftee with get a lot of use out of it. To me, you can never go wrong with gift cards. If you know a TV buff (which I'm sure most of us do) Netflix subscriptions are the way to go, and trust me, if someone paid for my Netflix subscription that would make my day. If you know a movie buff then gold class gift cards are perfect for the Hollywood treatment. My parents love receiving these and are sooo excited when they open this up and start planning for date night. A good pair of earphones of headphones are another great idea for absolutely anyone. We all need time to ourselves to zone out and what better way to do this than with a good pair that will help us tune out the world. I'm travelling quite soon and love the apple earphones because I know they are good quality and they also come in a travel friendly box. Looking to have a relaxing calming summer or know someone that is struggling to get into that comfortable sleep spot. T2 has you sorted. I think that it has the best selection of teas and I highly recommend checking out Red Green & Dreamy. Not only does it smell amazing, but every time I brew it myself it just makes me feel warm and relaxed putting all my muscles and my mind at ease. What's also great about this particular tea is its multi purpose use. (It's great as a summer ice tea!) Plus it's one of those teas that you can mix and match with other teas quite easily. So if you're going to grab this tea for someone, consider getting another one to go along with it. Let me know in the comments which of my gift guide ideas your now considering getting for someone these holidays. Or what are some of your go gift ideas this Holiday Season.